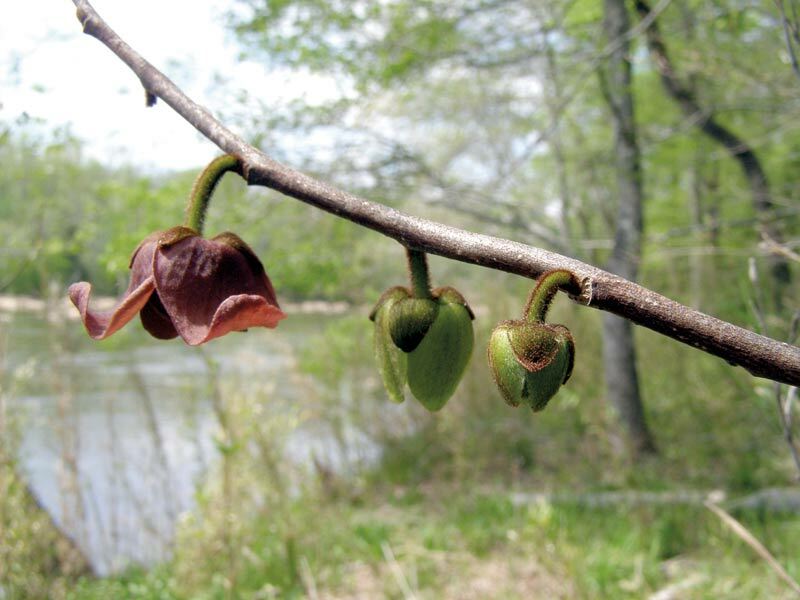 The Haw River Assembly’s Earth Day walk along the Haw River revealed a spectacular display of an ill-natured plant. No sooner had we entered the forest on the northeast side of the US 64 bridge than several walkers inquired about the heavy, perfumed fragrance wafting on the spring breeze. We eventually became accustomed to that scent, which accompanied us for half of our leisurely mile-long excursion along the river. 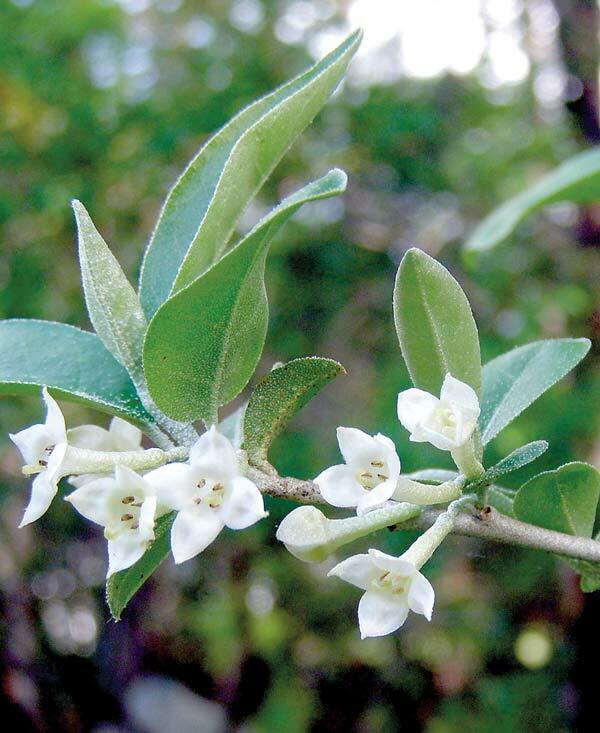 Some portions of the path were almost tunnel-like passageways through thorny thickets of this exotic shrub bearing countless clusters of tiny, white, four-petal flowers in the axils of silvery leaves. Years ago, I learned from one of my plant mentors to call this obnoxious invasive Ill-natured Agnes. Elaeagnus umbellata, is more commonly called silverberry or autumn olive. I prefer my friend’s name, because it certainly describes the plant’s success in running amok throughout local forests. It has even invaded my wild garden, requiring me to devote precious gardening time to eradication rather than more joyful pursuits of planting. Down along the Haw, as well as other local stream corridors, the silverberry has pushed out more desirable native plants like spicebush, Lindera benzoin, the host plant for spicebush swallowtails and local bird species. Though we began our discovery walk along the Haw with the realization that an alien was upsetting nature’s balance, we did discover a great variety of natives, including wild azalea, Rhododendron periclymenoides, mountain laurel, Kalmia latifolia, and my favorite, pawpaw, Asimina triloba, hanging on to their bits of riverside turf, along with a good variety of wildflowers. You can get more specific information on identifying and eradicating exotic invasives at Carrboro Day this Sunday by visiting the Plant Exchange site, annually hosted by members of the Carrboro Community Garden Club. For years, these gardeners have been at Carrboro Day providing good gardening wisdom and distributing extra plants from their gardens to anyone visiting their table. You are encouraged to bring plants from your own garden to share, but you don’t have to bring a plant to get a plant. Garden club members are thoughtful in not sharing invasives like English ivy, autumn olive and even some favorite exotic ornamentals like red-berried nandina, butterfly bush and crape myrtles, these last three beginning to show up in yards as volunteer seedlings. With so many worthy exotic plants that don’t pose a threat, there really is no excuse for responsible gardeners to plant specimens that are proven pests or that are giving indications they are about to become pests. You have an opportunity to learn more about the natural and cultural heritage and ways to protect the Haw River watershed, which includes Carrboro and Chapel Hill, at the family-oriented Haw River Festival at the Old Bynum Bridge this Saturday, from 1 to 6 p.m. In its 19th year, this event features hands-on activities, food and music for the entire family. Check out the website, www.hawriver.org, for more information. I’m leading a short river walk at 2:00 p.m. The staff and volunteers of the Haw River Assembly hope you will take part in this annual spring celebration of our local watershed.